For some of you the summer is a 'dead' period in terms of fish keeping whereas for others it finally gives them time to spend some more time on their hobby. I would like to propose to those that want to try something out, to put some of their fish outside this summer. You don't need to have a pond or a high tech set-up for this, nor a garden. 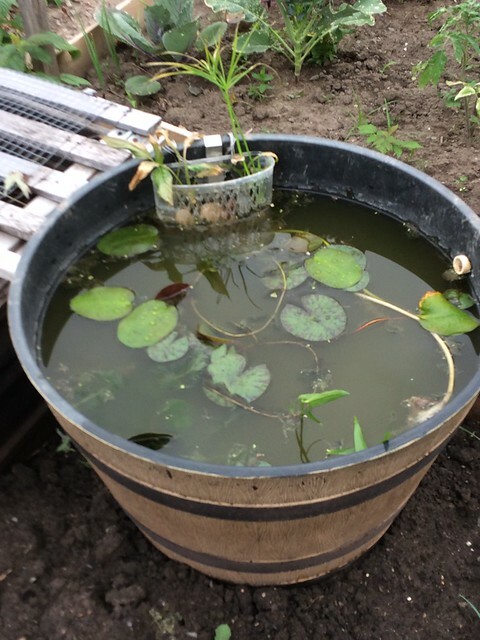 Actually, a 'Walstad' type set-up with lots of plants in a container as small as 5 gallons goes a long way to keep several fish successfully outside in a corner of a balcony or a small patio. 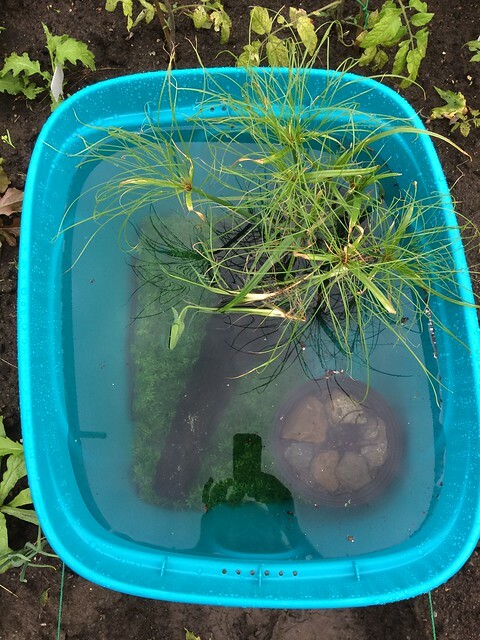 Some of you may remember the set up of @Guppyguy from last year, where he turned an old garbage bin in a summer residence for endlers and other livebearers. For the past 2 years I have successfully kept guppies and swordtails outside and this has made me long for more. The critters and algae in this setup made that I hardly did any feeding and no water changes at all. Only some top ups during drier times. I plan to keep a pair of paradise fish in a 20 gallon container with a lotus and some hornwort this summer, as well I am working on a set up for leopard danios. To this end I bought a 70 liter container in Canadian Tire, acquired a Madagascar lace plant and plenty of moss. There are plenty of fish that qualify for a summer vacation outside, like several barb types, some corydoras and minnows or even shrimp. @Alexmtl: what about trying to keep a few of your sunfish outside this summer and see how they fare compared to the ones inside? I will post my results and set-ups in this thread and I invite others to do the same. Who is with me for this experiment? Re: In for an experiment? may have to try this with some swords I have although I may have to use a heater for night times as we can get pretty cool 10C at night some times. @Biulu wrote: Actually, a 'Walstad' type set-up with lots of plants in a container as small as 5 gallons goes a long way to keep several fish successfully outside in a corner of a balcony or a small patio. I love the "Walstad" idea. If any of you want the Walstad article (not her book) on plant biofiltration, just PM me. @Biulu wrote: I plan to keep a pair of paradise fish in a 20 gallon container with a lotus and some hornwort this summer, as well I am working on a set up for leopard danios. To this end I bought a 70 liter container in Canadian Tire, acquired a Madagascar lace plant and plenty of moss. Sounds like a great setup. I think I will use hornwort and moss as well. @Biulu wrote: I will post my results and set-ups in this thread and I invite others to do the same. Who is with me for this experiment? I'm in. I love the idea. Not sure the fish or creature yet but now is the time to get started. I have to figure out what I am going to do about the raccoons who routinely visit, that I'm sure are the same raucous bunch that haunt Gary's outdoor ponds. I can imagine everytime he takes his broom out to chase them away they scoot over to my neighboorhood. @Fores41 wrote: may have to try this with some swords I have although I may have to use a heater for night times as we can get pretty cool 10C at night some times. Great Tim! If the container that you uses is somewhat insulated, the water will not show the large fluctuations that your daily temps have. @ alexmtl Maybe so type of cage/ cover made of chicken wire with pvc or wood as a frame? @Repteel wrote: Maybe so type of cage/ cover made of chicken wire with pvc or wood as a frame? Yes I was thinking about chicken wire and a frame. Not sure how I can make a hinged door yet so that I can access it. My other thoughts were along a lid of chicken wire and frame fastened with butterfly bolts to a tank rack frame. Giving myself this week to ponder, but I will at least get some water in the tanks to age. This book came out just on time! 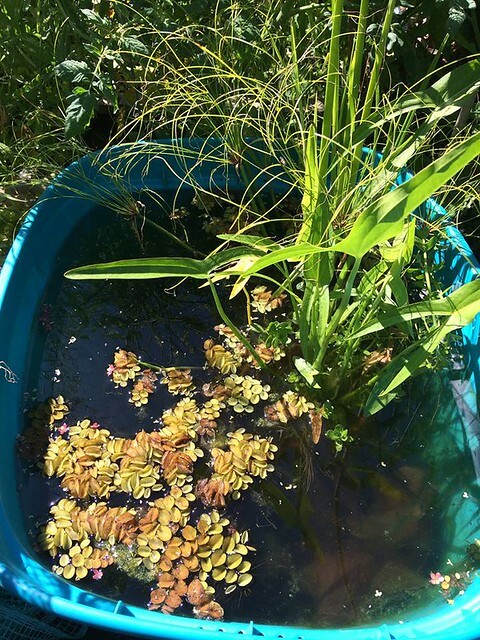 Pond tubs, a great guide for anybody trying something outside this summer. Hmmm, just saw a mother raccoon with three babies hanging around the toolshed. Well I'm going to give this a go but I have a feeling that this may be more of a dessert (for them). 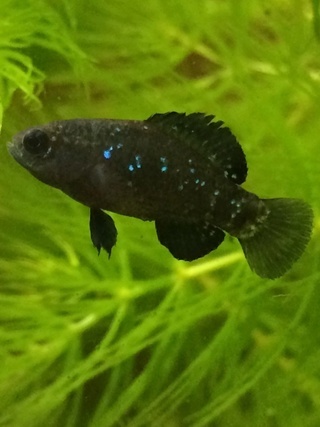 I don't think the pygmy sunfish are ideal candidates. They need food for them at the bottom and I reckon that most food will be mosquito or midge larvae which are surface feeders. @alexmtl wrote: Hmmm, just saw a mother raccoon with three babies hanging around the toolshed. Well I'm going to give this a go but I have a feeling that this may be more of a dessert (for them). If you are putting enough moss and other plants, I think there will be enough food in the lower parts of the tank. This is a 70 litre container that I bought for a few dollars. It is not very strong though and if it were not for the fact that it is partly embedded in soil, the plastic would be greatly deformed already. I plan on keeping leopard danios in it, hence the dollar store mats as it is an egg scatterer. 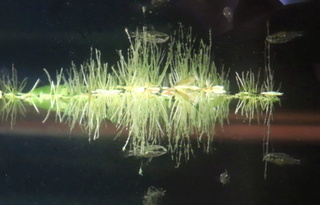 As plants it has: a Madagascar lace plant and a Cuperus (Papyrus plant). I still need to plant the 'Pijlkruid' (Sagittaria sagittifolia) that I obtained during a kayak trip yesterday. 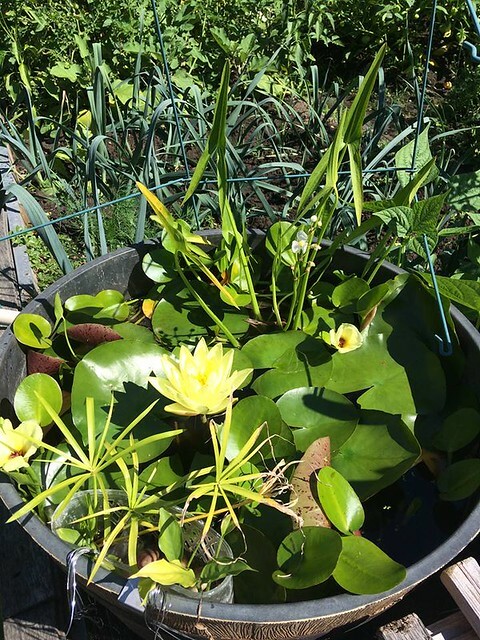 It has a German variety of water lily, again, some of the pijlkruid (sorry guys, don't know the English name, only the Dutch one...), a bunch of cabomba and some horn wort. It houses already a pair of paradise fish (Macropodus opercularis). The Cuperus is a great nitrate remover and I found it at Canadian Tire as part of their new 'exoticas' line. They also provide some shade. I'm contempling setting up a very small 5g tank with dirt and plants, with some endlers in it. 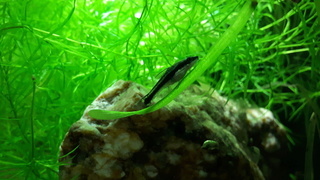 @l_l_l wrote: I'm contempling setting up a very small 5g tank with dirt and plants, with some endlers in it. Sounds good! I had guppies the first year and remember that Guppyguy used an old garbage can for keeping endlers outside. Plants: Flame moss, Madagascar lace plant, Bacopa monnieri, Cuperus and Sagittaria sagittifolia. I currently have 2 types of danios at a sheltered place so they can get used to the temps as my fish closet is around 30 degrees already. They are leopard danios and Celestichthys erythromicron, a micro danio from Myanmar. Hey Biulu are those Blue Paradise Fish you have outside or the Blacks? I plan to buy some Blue's for out side. @Fores41 wrote: Hey Biulu are those Blue Paradise Fish you have outside or the Blacks? I plan to buy some Blue's for out side. Yes, they are (opercularis). They are the hardiest but I know that @Zedex put some black ones outside successfully last year. I think it is a great choice Tim seen your water conditions as these fish can withstand a large range of temperatures and also thrive in hard water. I may try some Swords in another tub just for fun. My Paradise were suppose to come in today and they did not maybe next week. All I can do is wait and see now. 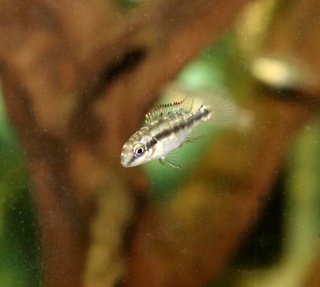 Most Mexican livebearers are a safe choice for a tub pond. Putting fish outside for the Summer? This from the guy with how many fish outside in ponds this time of year. @Fores41 wrote: This from the guy with how many fish outside in ponds this time of year. Even the sagittaria is flowering! If anybody knows what the small yellow flower is, please let me know. I got it at Big Al's as a pond plant. This one has more 'under water' plants. In this picture you can see how the Madagascar lace plant developed very well from just a bulb. 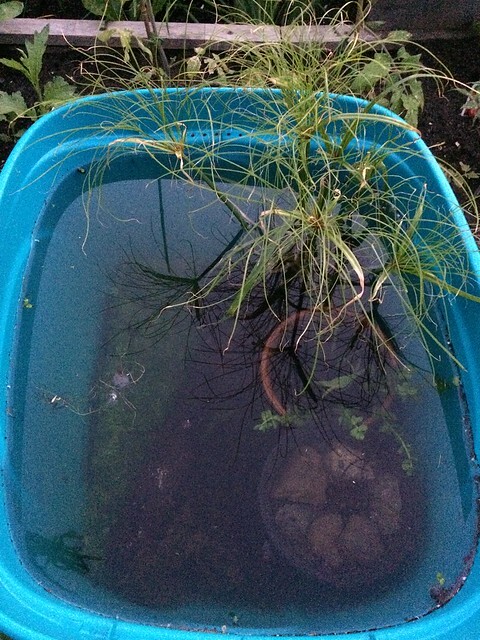 This tub has algae; hair algae mostly and some slimy green algae. 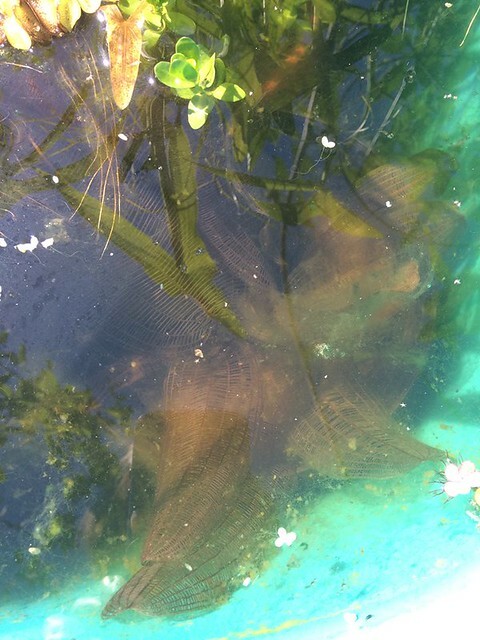 I do see fish swimming in the blue tub and I think it are the choprae's. Have not seen any shrimp, nor my paradise fish. I only touched a paradise fish one time when I moved something around in the water. Very cool, filling in nice. Bigger plans for next year?